1. 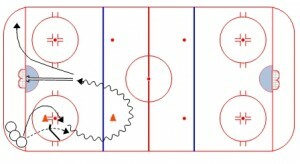 First player leaves line and skates through the cones as shown. 2. 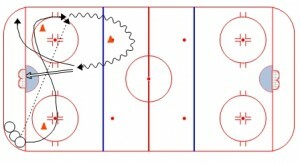 Next player in line fires a hard, stick-to-stick, cross-ice pass. 3. 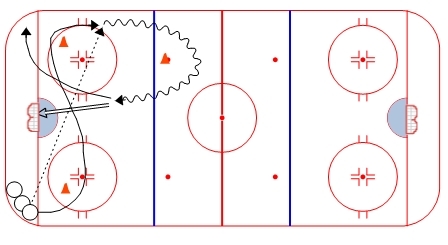 First player receives pass, skates up around the NZ cone, and fires a shot on net. NOTE: make sure to time your whistles so players aren’t skating in front of shots. 1. First player leaves and does a tight turn around the first cone. 2. Next player in line floats a “saucer pass” over the stick and onto the stick of the receiver. 3. First player skates up around the NZ cone, and fires a hard shot on net. NOTE: be sure to keep a quick whistle pace during this drill.